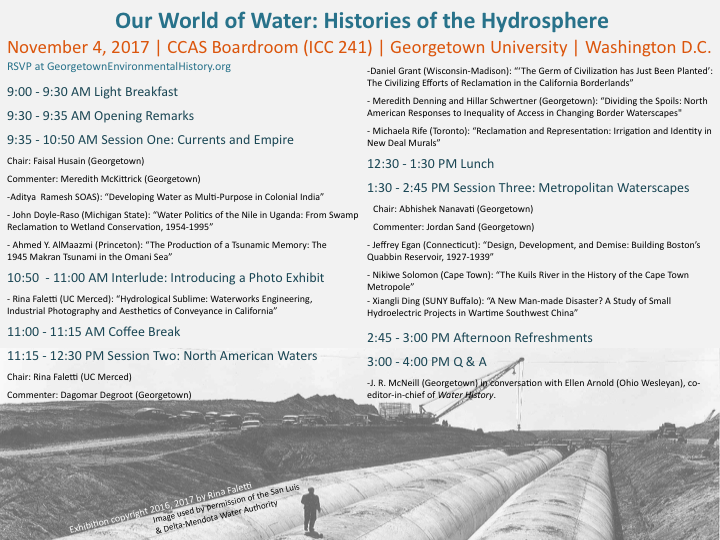 Come join Georgetown's environmental history community for a one-day conference on global water history, where we learn about the latest research in the field by graduate students from across the world. Featured papers will explore humanity’s relationship with the hydrosphere in the modern period, with case studies ranging from the waterscapes of Cape Town to the U.S.-Mexico border. Presentations will be followed by a discussion with Dr. Ellen Arnold, co-editor-in-chief of Water History. Meet fellow students and faculty members over coffee and lunch and tell us about your research and future plans! Questions? Contact Matthew Johnson, mpj16@georgetown.edu. This conference was made possible thanks to the generous support of the Graduate School of Arts & Sciences, the Office of the Provost, the Georgetown Institute for Global History, and the Mortara Center for International Studies.